Let me just start with just what a beautiful book this is, I literally devoured this in on go, I couldn’t stop reading. It was one of those moments of “just one more page. Let me finish this chapter, oh wait what’s going on? I best read the next.” and on and on it went and before I realised it, I was on the last page, I absolutely love it!! I was drawn to Harry Fanton the minute I met him in the previous book; Waltzing with the Earl and I am so pleased that Tinley has shared his love story with us. I have always loved an enemies to lovers trope and whether that was intentional by Catherine Tinley, but that is how I saw this, their bickering and sniping at one another and the way they have this private war burning below their polite façade is hugely enjoyable to see evolve through out the story. The story begins in – Dover, Juliana and her mother have just got off the boat from their long journey from Brussel’s as they make their way to visit her newly wed best friend Charlotte Fanton; Countess of Shalford. After taking refuge out of the pouring rain in the Kings Head pub they unexpectedly meet a suave, arrogant and breathtakingly beautiful soldier who riles Juliana up into a right tizzy, they immediately have a battle of wills – which does carry on through out the book, and yet as much as Juliana at times absolutely detests the Captain, he makes her blood boil with his interference and his arrogance and yet she cannot stop him from persistently popping into her mind and drams at every available moment which really cannot happen she has thing’s that needs to be achieved while at Charlotte’s. Harry has been sent back to England on an assignment for his commanding officer at Horse Guards, being a man of action, he thinks this is a waste of his time he would rather be on the battle field with his men than carrying out tedious – if important – tasks. He cannot wait to be back in Brussel’s again, he feels guilty that he has had to leave his regiment and all his personally trained men behind at the front, he hates the thought of his own men being under the command of another. On his way to see what his task is, he and his faithful Lieutenant stop at one of his regular stopping posts, The Kings Head to take cover out of the down pour, but what he finds there is quite worth being dragged back to English shores. Harry finds this feisty, argumentative and beautiful beyond compare, woman who irritates the life out of him and in the same way gets under his skin in a way that has never happened to him before. she had tried to keep him at a distance, something which he had taken as a personal challenge. Her coolness was no match for his confidence in his ability to charm young ladies. Both think that once they leave the Kings head that, that’s the last they will see of each other, how wrong they were. Once at – Juliana spots an intruder trying to break into her friend’s home, obviously she does the only thing she can do, and wallops the potential thief with a shovel only to realise that it’s the arrogant and irritating man from Dover, but not only that he is her best friends brother-in-law. That is very amusing and Harry even though he has just been attached by the spritely young woman he is just as flirtatious and wickedly charming as ever. Now they are both in the same house for the next few weeks it is highly amusing seeing them get to know each other, and what we found out about these two individuals throughout the story is emotional and dramatic. There are secrets lurking in both Harry’s and Julian’s lives, she knows that her mother is keeping things from her, information about her history Juliana doesn’t know what that could be, but she knows that this is the prime time to try to garner what those secrets are. But once Juliana does finally learn the truth she is both saddened and shocked, how could her mother not tell her? Especially as this could change her life. Harry’s secret is that through his experiences from war he is wounded not physically, but psychologically he is a very vulnerable man who has seen too much horror, seen things that no man should see and those experiences have imprinted themselves on to him. He still acts the cheeky go lucky chap, with his dazzle smile but deep down he needs help, he is hurting he sees himself as a coward, as damaged and unworthy which is so far from the truth he is a beautiful man inside and out. This led his thoughts to Juliana, for the thousandth time that day. His chest swelled as he thought of her—her fiery, passionate nature, and the miracle that she could love a man as broken as he. As I knew he would be, Harry is a real charmer of the highest order and when he decides to flirt and woo, no lady has a chance, Juliana intrigues him he instantly drawn to her and also calmer around her, even when they are bickering. As he works his own unique magic on her icy armour it is lovely to see how he slowly cracks the ice away with just a smile. But then it isn’t called the “Dazzle Smile” for nothing. But he is a man who is in real pain, beneath the flirtatious military persona he is a man who is suffering, he is tormented. Which is why Juliana is such a great match for him, she can match his argumentativeness, his stubbornness and his fire and pride, and yet she knows how to sooth those that need it. She knows how to take care of those that need caring for and vise-versa, Harry is firm and solid, he is the reliable strong-arm that she needs to guide her past her own volatile pride. I do like Juliana after always doing things for herself and never relying on anyone but herself, she absolutely hates any kind of help or as she calls it interference. I feel a really strong connection with Juliana, she is caring for her much weaker mother, and running their everyday lives single-handedly all this is a tough job and she does it with so much dignity. She has got so much pride and just by accepting assistant from this stranger is a real wrecking ball to that pride. I think that Juliana could be the best heroine I have met this year she is just a wonderful testament to what a woman can do, and what we who care for loved ones do and how much we sacrifice. I won’t give too much away but the way Tinley has captured the mixed emotions of Waterloo war is mesmerizing. You feel the sadness and despondency of the men and the civilians. Those chapters that cover the battle are superb, the detailing of what was going on and how everyone was coping and the actual battle scenes where Harry is in hand to hand combat is brutal and engrossing. This is atmospheric and so beautifully written and from reading this, I do think Tinley has a gift for capturing those little nuances in human thought and feeling and placing on the page. I have been looking forward to this story and it was so much more than I expected, you’ve probably guessed by my gushing how much I love this book and that I cannot recommend this enough, this is a must read! If you like your charming yet fragile heroes, feisty independent heroines all brought together with a stonking good plot and tied off with some beautiful romantic scenes and moments then this is the book for you. 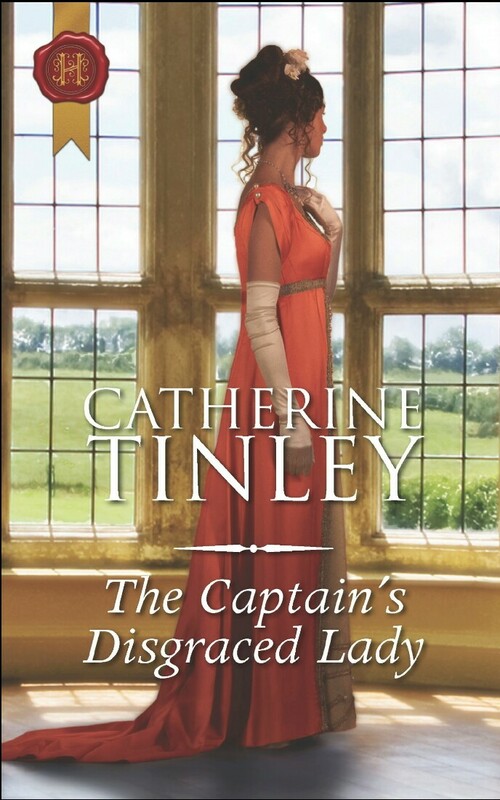 The Captains Disgraced Lady is released from 28th December and can be pre-ordered on Amazon. This entry was posted in ARC, Historical Romance, Regency, Reviews and tagged ARC, Catherine Tinley, Harlequin, Historical Romance, Mills and Boon, Regency, Review, Waltzing With the Earl. It is so good that we share an appreciation for Ms Tinley’s style of Regency Romance!! 🙂 Like you, I remember dissolving so readily inside this novel, it was hardly the moment to come up for air so to speak! My thoughts as I read this last January — it was interesting how I became so dearly attached inside this novel as I honestly have the tendency of reading series in order of sequence. With this one, I found her at the time of the second release and the first novel (Waltzing) was not as readily easy to find a copy of — ironically, in the Autumn months I did snag one at long last! Ha! I can see now how the foundation was set for the brothers to such a degree I’ll refrain from fuller thoughts til I have the chance to re-read this installment! I want to re-read it ahead of moving into “The Makings of a Lady” — Ooh speaking of that, you might spy some trivia on my interview for Tinley! I won’t link it here but you should find it attached below the review I linked in-line just as easy! One quick Q: which author in Mills&Boon HistRom do you like in the same writing vein as Tinley? I have been trying to seek out other authors who write like she is writing?